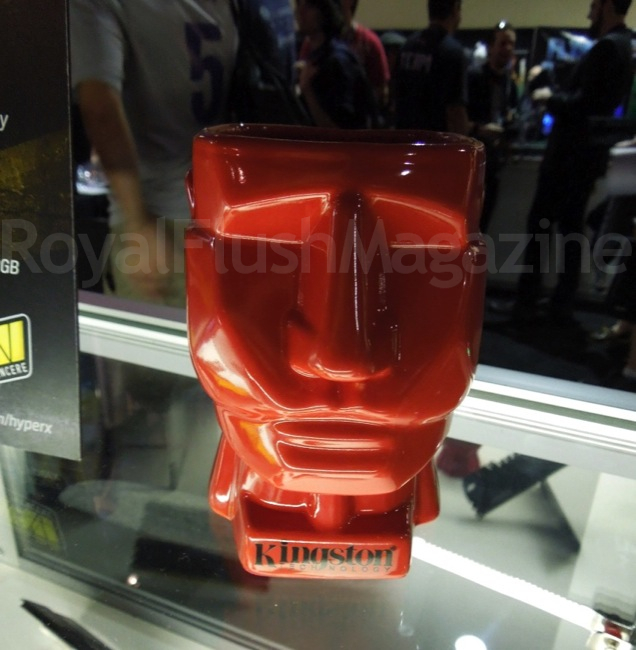 Kingston continues to be a main player in the stage of PC and storage components while keeping style as an integral component with their HyperX branding. They root themselves even deeper into the gaming arena with their sponsorships of headline professional gaming teams Cloud 9 HyperX and Team Solomid. The two teams did Kingston proud as Cloud 9 HyperX placed 1st and Team Solomid placed 2nd at the League of Legends American Regional Finals at Pax Prime. 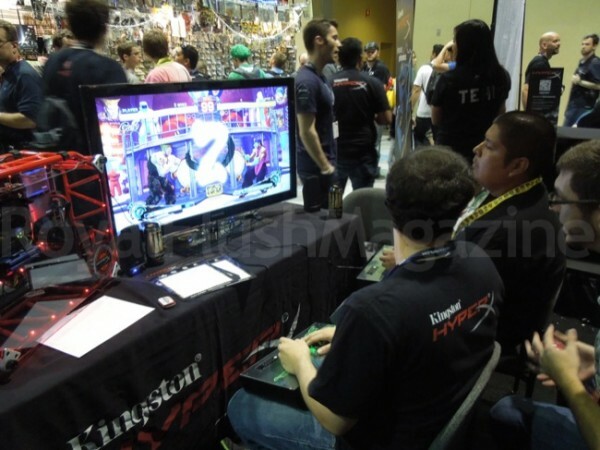 Back at the HyperX booth, the populous was able to enjoy some competitive gaming, get slapped around in Street Fighter 4 by renowned Justin Wong in person, or check out the latest in HyperX products. Continue on to take a glance at what was on display at the booth. Kingston’s HyperX line-up gets the job done in the performance field. Not to mention that the array of colors available for these quality components allow custom PC builders to make their rig look exactly the way they envisioned: stylish and unique. Take a look at what is possible with just a drop of creativity, and the right assortment of HyperX components. This Kingston employee was able to put this together in a matter of hours, and at the last minute. However, by the looks of this thing, we wouldn’t have known the timeframe if he didn’t tell us. And here is another case he made using more HyperX components. 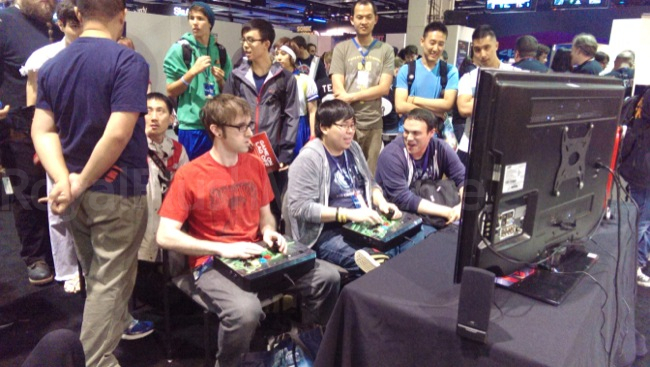 This rig was powering the Street Fighter 4 session to the right where players tried their luck against Justin Wong. 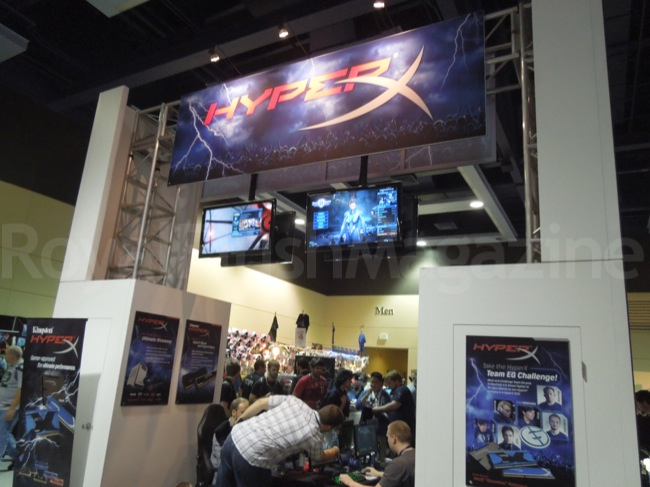 As for the showcased products, I have always been a fan of the DataTraveler HyperX series of flash drives. The HyperX Predator 3.0 USB Flash Drive is as small as beasts can come in. Available in a 1TB capacity, it runs at speeds of up to 240MB/s read and 160MB/s write. My personal favorite is the blue DataTraveler HyperX 3.0 (also seen in the above video). A new favorite that hits home with me (as does anything colored black and blue) is the new SteelSeries Siberia V2 HyperX edition headset. Being an owner of a SteelSeries headset, I can already endorse the respectable sound quality. 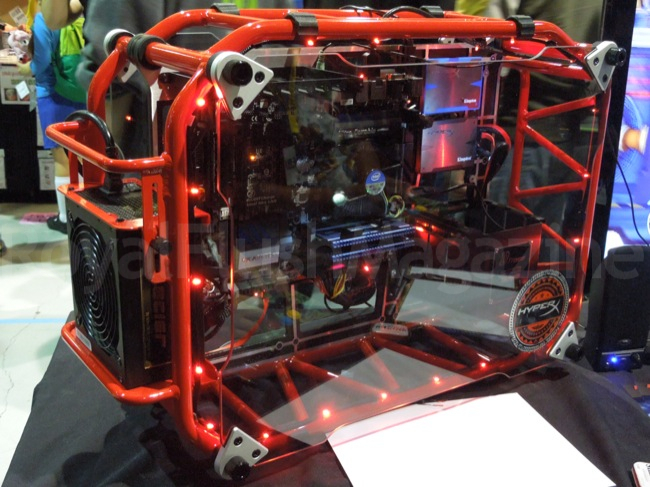 If you noticed, those were HyperX 3K SSD’s in those custom rigs. Aside from simply looking great in any see-through rig, these SSD’s sport High-Speed SATA Rev 3.0 (6GB/s) transfer speeds. Clearly, Kingston HyperX components continue to pack a punch as powerful as their elegant exterior. Whether you are looking to build your own case or buy the new HAF Stacker, when it comes to the internals you should look towards HyperX first.